Hitting a ball is a great activity for developing eye-hand coordination, and it lays a foundation for many sports activities as your child grows. As a bonus to you, this section provides some great games your child can play while you are cooking dinner or otherwise occupied! Have you noticed how fascinated little ones are with balloons? 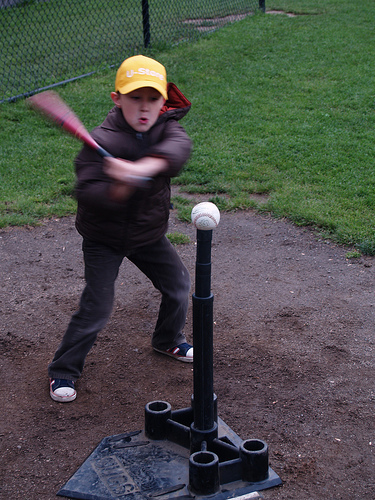 Batting a balloon is a perfect early step to learning how to hit a ball. Start with a helium balloon anchored to the ground by a string. (Tie it to something heavy.) Show your child how to hit the balloon and then wait til it pops back up again before he hits it again. This helps him follow its progress with his eyes, work on depth perception, and develop a sense of timing in hitting a ball. Once your child is batting a helium balloon well, tie a regular balloon to the top of a door frame, perhaps in the entrance to your kitchen, so he can practice while you cook or clean. The balloon should be hanging about waist-level for him. Show him how to hit the balloon with the palm of his hand (forehand) and with the back of his hand (backhand). Hanging balls and balloons work great for a solo child, because he doesn’t have to chase the ball. If you want to play too, or if you have more than one child, balloon volleyball or balloon tennis is a fun game. We played in our living room with a sofa as the “net,” but you can do whatever fits your house. We put one person on each side of the “net” and batted the balloon back and forth with our hands or with paddles, trying not to let it touch the ground. Older children can keep score if that is fun for them, winning a point for each time the ball touches the ground on their opponent’s side. There are really no age limits to this game. Cheap date night, maybe? These games lay excellent groundwork for graduating to badminton, volleyball, t-ball, tennis, and many more sports. Plus, they get your child moving and develop skills that spill over into many areas of life.